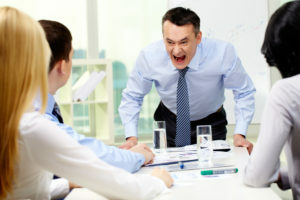 In the past few months, I have had a number of executive clients bring up the subject of horrible bosses and their frustrations. They either are forced into the role of Toxic Handler or jump into it naturally. A Toxic Handler is somebody that helps act as a buffer between a volatile leader and all of the employees within their domain. Picture a boss who blows up without warning. Everyone in the company tiptoes around them. The Toxic Handler is the savior. They take it on as their personal responsibility to deflect the hostility away from their teammates. Sometime throwing humor into the mix; sometimes just bearing the brunt of the storm. They know it’s not personal. They know it’s not just about them. It’s their job to defuse the bomb. In fact it was a bad boss and a general jackass that put me on a path to becoming an entrepreneur. I have also been guilty of being a jerk of a boss myself. You can read more about that in My Apology below. * Only Provide feedback moments before shipping/launch/delivery and throw the whole project into a tailspin. * When there is a problem, employees will work to bury it if they can’t fix it. No one wants to deliver the bad news and become the next target. I know I have been guilty of being the Bad Boss myself. SonicMG was still a startup with only a few employees. I walked into the office one morning to find everyone’s computer, but no employees. I searched the entire building, called cell phones, but no answers. About 45 minutes later, everybody rolled into the office laughing and talking. I blew up. “Where the hell have you guys been? I have been calling all over the place. You can’t pick up a phone? Don’t you care about the company; about our clients? What is wrong with you people?” I didn’t wait for answers, just stormed off to my own corner of the office and pouted for the next hour while I pretended to get some work done. A while later Tony came in and, calm as a Hindu cow, started to explained what had happened. (Apparently he drew the short straw.) Tony shared that one of our other people, Lindsey had some car trouble. She called the office and Tony and Ted were already at work. They both rolled to help her out. Nobody was watching their phones, because they were all busy helping each other. I felt like a total jerk. What’s worse I didn’t even have the stones to tell them that I was terrified that something horrible had happen to the people I cared so much about. Stupid, I know, but a lot of goofy thoughts run through your head when there are no good answers. So we had this uncomfortable standoff for a few hours until Tony played the Roll of Toxic Handler and defused the bomb. He’s good like that. Tony, Ted, Lindsey – I owe you all an apology. For that morning and probably a few others. Maybe you know someone that you would like to recognize as a true Toxic Handler. Give them a shout out here or on the LinkedIn article so others can appreciate their greatness too. * Peter J. Frost first coined the term Toxic Handler in his book “Rhythms of Academic Life” written in 1996.